I just read an article in dirt rider that stated the AMA had a petition to increase the displacement of two strokes in AMA racing to allow them to be competitive.With Honda discontinuing the CRs, is too little too late.Just wondering what everyone thought. They are??? Where did you get this fact?? If the 250 2 strokes were so much faster than 450 4 strokes you'd see everybody racing them at the pro level. Only the few Factory guys would have to run 4 strokes. The fact is, 450 4 strokes are faster because the horsepower is more useable to the rider. The rider can turn faster lap times and that is the name of the game. Ultimate peak horsepower has nothing to do with MX racing. There are many races where the 250 lites riders are just as fast as the 450's, in some cases faster. How many MX races are won by being faster in the straightaways as opposed to being faster in the corners? On a dragstrip, for an eighth of a mile, you may be correct. Go back and check yourself. The only advantage the 2 stroke has over the 4 stroke is they are a touch lighter. Power is useless if you can't translate it to traction. Last edited by AgentSmith on Sun Jul 13, 2008 10:08 pm, edited 1 time in total. You're miles away from being even a little right. The new MXA has a shoot-out between the 08 YZ250 two and four strokes, 250's. With it's 10 hp advantage the two stroke beats the four stroke at every start, but guess what their lap times were ? EVEN. That's because as AS said, the power is easier to modulate, to control, with the thumper. A 450 thumper vs. a 250 two stroke is no contest with riders of the same ability on a motocross track and not in a 'drag race' either.The 450's are faster, by plenty. 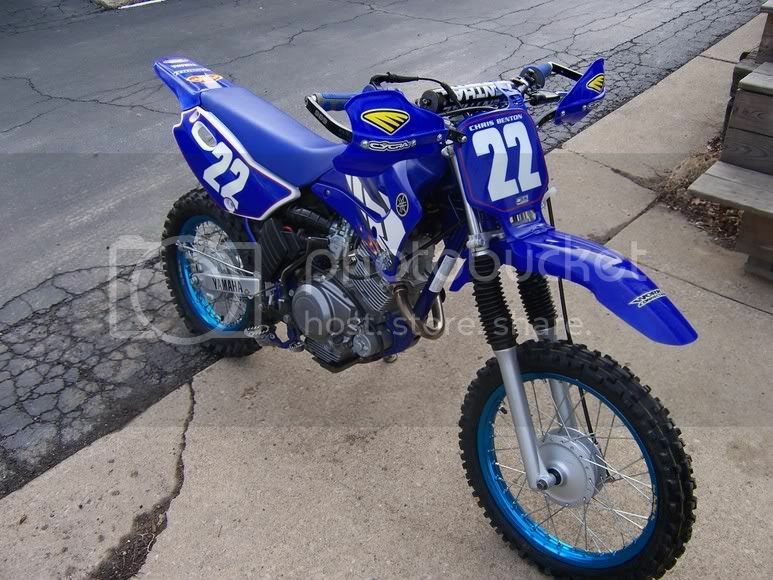 I think two strokes are better in the woods and so will most GNCC types tell you when they're being honest. I know the thumpers are superior than 2 strokes in motocross and absolutely in cross country stuff. With the exception of California and their completely wrong and idiotic CARB rules, emissions and the EPA have nothing to do with the demise of two strokes. SALES and the absurd AMA has everything to do with it. Recently Euro sales of two strokes have surged after their version of the EPA published an 'oops' paper about two strokes not being any worse than thumpers after all. Duh. Not in a million years is any stock 250 two stroke faster in any speed contest than an equivalent 450 thumper. Even in modified versions. When a few two strokes were still going up against 450 Thumpers in supercrosses and Nationals the hole shots and straights belonged to the thumpers. thank you Doug for typing something..although i'm not sure you got through. You need to lay off sniffing the glue so much.